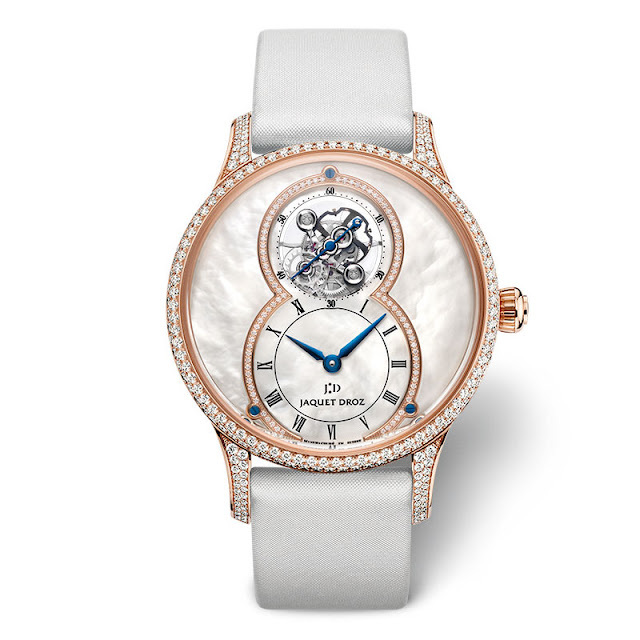 Jaquet Droz returns to its legendary Grande Seconde to create a new standard in women's watches. To achieve this, its craftsmen have worked with one of the most beautifully luminescent materials: mother-of-pearl. Its shimmering contrasts with the red gold of the case and the inner bezel ring, further enhanced by a river of diamonds. 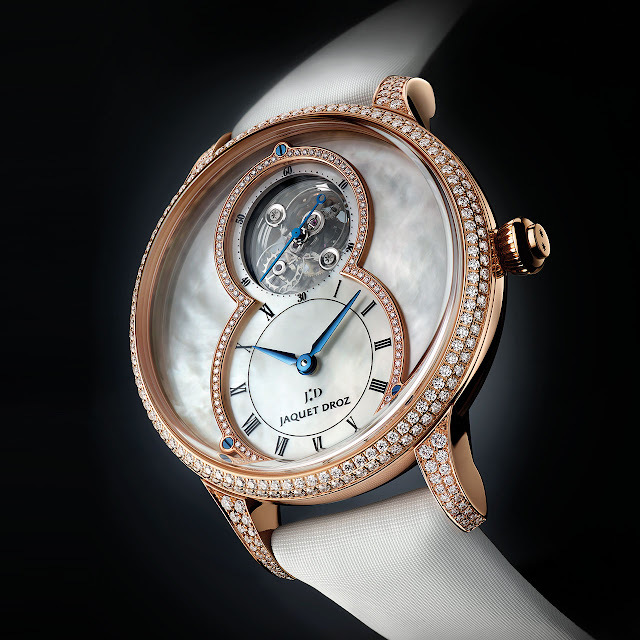 Precious and refined, the Grande Seconde Tourbillon Mother-of-Pearl has secrets of its own, beginning with the white mother-of-pearl adornment on the oscillating weight, and the bridges with a fanned Côtes de Genève motif. One of the masterpieces of horological complications resides at 12 o'clock: the tourbillon. A miniature mechanical sculpture, this is the first time Jaquet Droz has given its tourbillon a silicon balance-spring and pallet horns, the guarantee of absolute and lasting precision. 88-piece limited series. 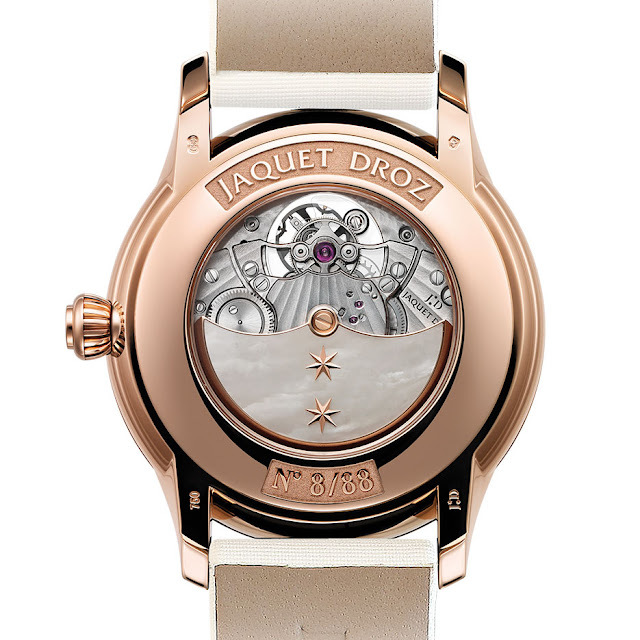 Mechanical automatic, Jaquet Droz 25JD tourbillon calibre, 31 jewels, 21,600 vib/h, silicon balance-spring and pallet horns, 18k red gold oscillating weight with white mother-of-pearl applique, 7-day power reserve. 18k red gold, 39 mm. Set with 260 diamonds (1.41 cts). Water-resistant to 3 bar (30 m / 100 ft). White mother-of-pearl. 18k red gold inner bezel ring set with 90 diamonds (0.12 ct). Blued steel hands. Tourbillon cage and seconds at 12 o'clock. Hand-folded white satin with 18k red gold folding clasp set with 32 diamonds (0.32 ct).